The aftermath of the 13 Nov. attack, which left 45 dead (mostly women, children and the elderly) in southern Kaduna State. A spate of attacks on Christian communities in Nigeria last weekend left 45 dead and several more injured. 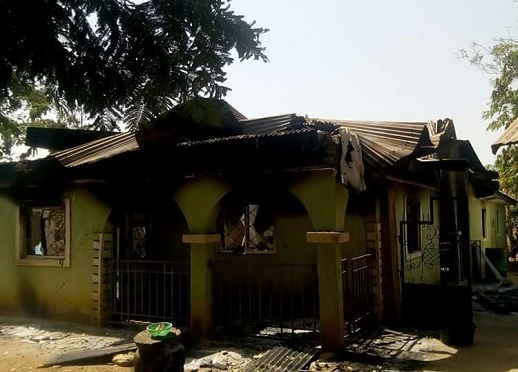 The attacks took place in five villages in the Kauru Local Government Area, in the Middle Belt state of Kaduna – an area mostly populated by Christians, on Sunday 13 November. Most of the victims were women, children and the elderly, who could not escape the gunfire of the attackers, believed to be Fulani herdsmen. One hundred and twenty houses, including eight house-churches, were burnt down. A resident of Kitakum (one of the villages), Samuel Adamu, told World Watch Monitor the attackers came at around 7pm local time. “They laid siege to the village before they started shooting sporadically and throwing explosives at our homes,” he said. “They were armed with guns, knives, machetes and explosives. Adamu accused the government of failing to stop the persistent attacks that have claimed hundreds of lives in southern Kaduna. The attacks came a day after the Fulani herdsmen and indigenous communities in Kauru and neighbouring Local Government Areas resolved to live at peace with each other. That peace-deal ceremony, held in Samaru Kataf, was attended by Kaduna Governor Nasir El -Rufai, who commended the communities and assured that his administration was determined to ensure security of lives and property. In reaction to the 13 Nov. killings, the state government’s statement condemned the “barbaric” attacks, saying they would not derail ongoing efforts at peace-building in southern Kaduna. 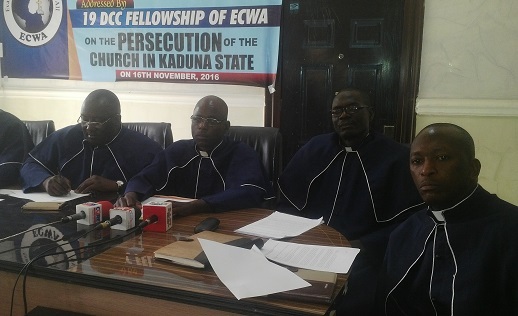 The Evangelical Church Winning All (ECWA) is the main church organisation in Kaduna (950 churches, over 2 million members) and most of the victims were ECWA members. Its Chairman for Kaduna State, at a news conference (16 Nov.), blamed the ongoing violence on a quest for grazing reserves. “We have come to the unfortunate conclusion that the announced intention of the Kaduna State Government – to re-create existing cattle grazing reserves in southern Kaduna – serves as a major motivation for the renewed ethno-religious violence and cleansing currently being visited on southern Kaduna communities,” said Rev. Zachariah Gado. Since March 2013, at least 180 have been killed and 10,000 displaced, while hundreds of properties, including dozens of churches, have been burnt down. He also said last week’s donation by the Kaduna state governor for the reconstruction of churches destroyed during the attacks was a misplaced priority, saying that the money should have been given to security agencies. Since March 2013, at least 180 have been killed and 10,000 displaced, while hundreds of properties, including dozens of churches, have been burnt down. Some 16 villages have been overrun by Fulani, who are now fully settled with their cattle and families, noted Gado. He appealed to both the State and Federal governments to restore all communities taken over by herdsmen to the rightful owners, saying that failure to do so will only encourage further lawlessness. Zachariah Gado also reiterated his calls for the establishment of a military base in southern Kaduna, to end the killings. 45 killed, 120 houses, including eight house-churches, burnt down, as Fulani herdsmen laid siege to five villages (Kigam, Kitakum, Unguwan Magaji , Unguwan Rimi and Kizipi), all in Kauru Local Government Area, about 300km east of Kaduna. Attacks on Misisi village (Kaninkon Chiefdom): seven killed, including the village head, 26 houses burnt down. Also, attacks on Pasakori (3km from Misisi): two killed and 16 houses burnt down. Godogodo: over 300 militiamen laid siege to the town. The killings and arson continued into 16 October and left 30 dead, 27,819 displaced, 326 injured and 326 homes burnt down, including seven churches. Properties estimated to be worth thousands of dollars were looted and destroyed. Godogodo: seven killed as Fulani militia attacked the town (where thousands forcibly displaced from surrounding communities have sought refuge). The next day, an attempted raid was repelled by local vigilantes and security forces. Akwa: two killed, 20 buildings burnt down, including churches. Golgofa: nine killed and the entire town razed to ashes. Unguwar Anjo village (estimated population 3,500) burnt down. A pastor and a community leader killed among others, two churches, including lots of materials, destroyed. Ninte: the entire village burnt down, including three churches, three vehicles and foodstuffs. Unguwan Kafinta, Dangwa villages attacked: five killed and 298 properties destroyed.